UPDATED – NEW YORK (CNS) — New York Mayor Bill de Blasio said it would be an “extraordinary moment for our city and an extraordinary honor” if Pope Francis visited the Big Apple in September 2015, when the World Meeting of Families takes place in Philadelphia. 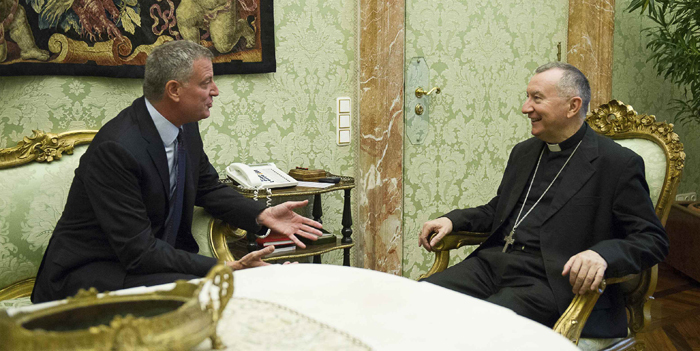 De Blasio went to the Vatican and met July 21 with Cardinal Pietro Parolin, the Vatican’s secretary of state, “to relate how important it would be for the people of New York City to have the pope visit,” the mayor said. Organizers of the international family gathering have been hoping Pope Francis will come to the event. On July 24 Archbishop Charles J. Chaput of Philadelphia, the host archdiocese, announced the pontiff had accepted his invitation to attend, even though the Philadelphia Archdiocese still has not received official confirmation from the Vatican. Other U.S. church and civic leaders remain hopeful the pontiff might add a couple of other U.S. cities to his itinerary. In Rome de Blasio held a news conference following his visit with Cardinal Parolin. U.S. Ambassador to the Vatican Ken Hackett also attended that meeting and joined de Blasio at the news conference. A transcript of their remarks to the media was posted on the website of the mayor’s office. “The meeting was very positive,” de Blasio told reporters. “The secretary of state (is) an extraordinary man and it was such an honor to spend time with him, and to relate to him how important it would be for the people of New York City to have the pope visit. “We understand no one has a more difficult schedule in the world than the pope. And nothing definitive was decided in the meeting, but Cardinal Parolin was very open to the request,” he added. The World Meeting of Families is sponsored by the Vatican’s Pontifical Council for the Family every three years in a different city. The 2015 gathering will take place Sept. 22-27. Pennsylvania Gov. Tom Corbett and Philadelphia Mayor Michael Nutter are co-chairmen of the event. In May, Archbishop Vincenzo Paglia, president of the Pontifical Council for the Family, visited Philadelphia. In March, Archbishop Chaput visited the Vatican with Corbett and Nutter as part of a delegation of government, religious and community leaders meeting with church officials to plan the family gathering. At the news conference with de Blasio, Hackett noted Cardinal Parolin was “very generous with his time” and also touched on the immigration issue in the U.S. He said the prelate was interested in New York’s experience with immigrants, specifically a new ID card that gives those who entered the U.S. illegally and live in New York access to government services. De Blasio signed the card bill into law July 11. De Blasio added that their discussion covered the crisis at the U.S.-Mexico border with the surge of unaccompanied minors and adults from Central America.